1. Graduate from a reputed university in mentioned subjects with at-least two first division/class. g. Sonali Bank Limited (SBL), Rupali Bank Limited (RBL) and Bangladesh Krishi Bank (BKB) has power to decide anything and can take any decision. After application completed online application, Bankers´Selection Committee Secretariat(BSCS) will call for the MCQ exam in 100 numbers. For that candidates must download admit card and seat plan from the Bangladesh Bank website at https://erecruitment.bb.org.bd/index.php. Only eligible candidates will get SMS for download admit card and information about seat plan. Bankers´Selection Committee Secretariat (BSCS) authority Mobile SMS declaration will be published Admit Card. Every applicant can download login with User Id and Password at https://erecruitment.bb.org.bd/onlineapp/print_admit.php. Bankers´Selection Committee Secretariat (BSCS)authority Mobile SMS declaration will be published Seat Plan and Exam Center at your Admit Card. You can download Admit Card login with User Id and Password at https://erecruitment.bb.org.bd/career/jobopportunity_bscs.php. Bankers´Selection Committee Secretariat (BSCS) authority will be published at their Official website notice board https://erecruitment.bb.org.bd/career/jobopportunity_bscs.php. 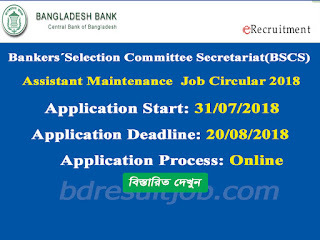 Tags: Bankers´Selection Committee Secretariat(BSCS) Assistant Maintenance job circular 2018, www.bb.org.bd, www bb org bd, erecruitment.bb.org.bd, www erecruitment bb org bd, job opportunities, govt job circular, bangladesh bank job, bank recruitment, government jobs in bangladesh, bangladesh bank recruitment, bank job circular, bangladesh bank circular, application for bank job, bangladesh bank job application, latest bank job circular, govt bank job circular, job bank, government jobs, government jobs in banks, bank careers, bangladesh bank recruitment, bank job circular, govt job circular, bangladesh bank circular, bank recruitment, recent bank job circular, bangladesh bank apply, bd job site list, bangladesh bank job application, all bank job circular, bangladesh bank apply online, bd bank job circular, bank job circular 2018, recent govt job circular,job websites in bangladesh,all bank jobs bd, bangladesh bank job, bd jobs bank, bank job, Bankers´Selection Committee Secretariat (BSCS) Assistant Maintenance Recruitment Online Application Form, Bankers´Selection Committee Secretariat (BSCS) Assistant Maintenance Viva exam date, bb org bd, Bankers´Selection Committee Secretariat (BSCS) Assistant Maintenance final selection Result 2018. 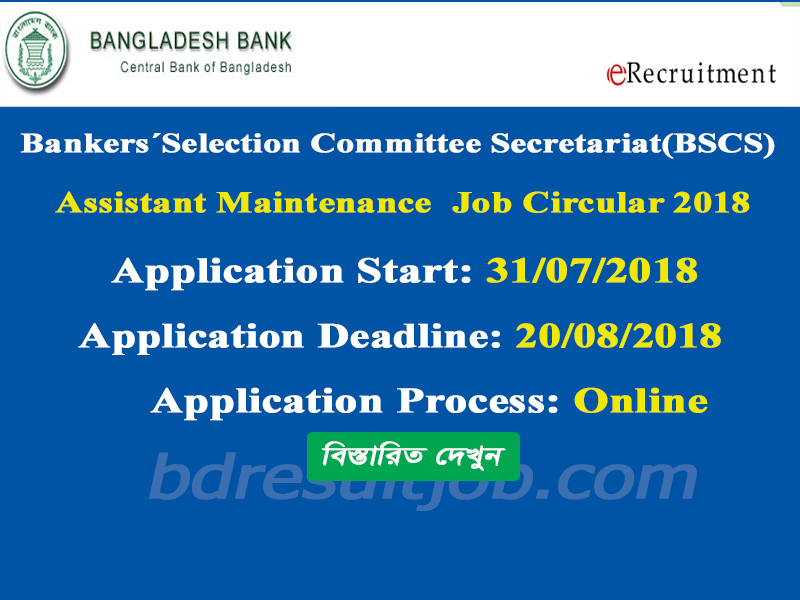 Bankers´Selection Committee Secretariat(BSCS) Assistant Maintenance job circular 2018, www.bb.org.bd, www bb org bd, erecruitment.bb.org.bd, www erecruitment bb org bd, job opportunities, govt job circular, bangladesh bank job, bank recruitment, government jobs in bangladesh, bangladesh bank recruitment, bank job circular, bangladesh bank circular, application for bank job, bangladesh bank job application, latest bank job circular, govt bank job circular, job bank, government jobs, government jobs in banks, bank careers, bangladesh bank recruitment, bank job circular, govt job circular, bangladesh bank circular, bank recruitment, recent bank job circular, bangladesh bank apply, bd job site list, bangladesh bank job application, all bank job circular, bangladesh bank apply online, bd bank job circular, bank job circular 2018, recent govt job circular,job websites in bangladesh,all bank jobs bd, bangladesh bank job, bd jobs bank, bank job, Bankers´Selection Committee Secretariat (BSCS) Assistant Maintenance Recruitment Online Application Form, Bankers´Selection Committee Secretariat (BSCS) Assistant Maintenance Viva exam date, bb org bd, Bankers´Selection Committee Secretariat (BSCS) Assistant Maintenance final selection Result 2018.